Manufacturer: Anhui Anke Biotechnology, China. Package: 10 IU + injectable water. 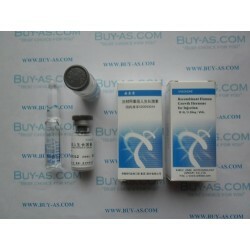 Ansomone® is a kind of sterile, lyophilized formulation of Recombinant Human Growth Hormone (HGH) with 191 amino acids, derived from engineering E.coli, and it is identical to the natural growth hormone in amino acid sequence and three-dimension structure. Ansomone® is indicated for growth failure due to endogenous growth hormone deficiency (GHD) and Turner disease or Kidney failure. Ansomone® can be used to heal up the surgery wound or burned wound and it has good effect to preservation for human aging. Our manufacturing plants of Ansomone® are certified for GMP Standard by sFDA. 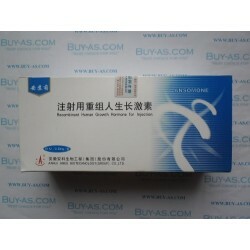 Generic name: Recombinant human growth hormone for injection. 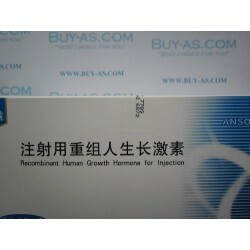 Trade name: Ansomone® Composition in effect: Recombinant human growth hormone. Ansomone® exerts the same actions of endogenous human growth hormone. 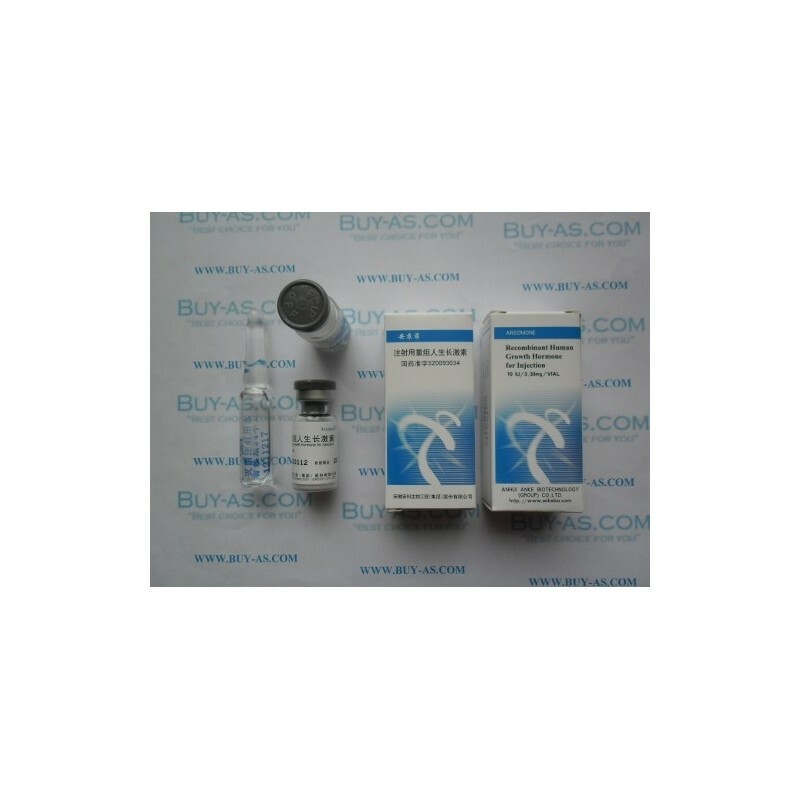 It can stimulate proliferation and differentiation of epiphysis chondrocyte, stimulate growth of cartilage matrix cells, stimulate proliferation and differentiation of osteoblast; thus accelerate the liner growth rate and improve epiphysis width. Ansomone® can promote protein synthesis in whole body; reverse the negative nitrogen equilibrium caused by wound and surgery; correct the hypoproteinemia due to severe infection or hepatocirrhosis; stimulate synthesis of immune globin and proliferation of lymphadenoid, macrophage and lymphocyte, thus enhance the ability of infection resistance; stimulate proliferation of collagenocyte, fibroblast and macrophage in sites of burn and surgery, thus accelerate wound healing; promote synthesis of cardiocytes, thus improve cardiac contractility and reduce cardiac oxygen consumption; regulate lipometabolism, thus depress serum cholesterol and low density lipoproteins level; complement insufficiency or deficiency of growth hormone, regulate adults lipometabolism, osteometabolism, heart and kidney function. It is reported that the equal pharmacological effect could be achieved via subcutaneous (sc) or intramuscular (IM) administration. Even though sc may lead a higher concentration of GH in plasma, IM could also yield the same IGF-l level. The absorption of GH is the relatively slow, Cmax often occurs at 3-5 hours after injection. Clearance of GH is via liver and kidney, the half-life of clearance is about 2-3 hours. Uncatabolized GH excreted in urea is almost immeasurable. All of the GH in circulation system exists as a complex form with GH binding proteins that make the half-life of GH prolonged. Ansomone® is indicated for the growth failure of children due to endogenous growth hormone deficiency (GHD). When reconstitution 1 ml sterile water for injection should be injected along the bottle wall, then swirl the vial with gentle rotary motion until the contents are completely dissolved, do not shake violently. The recommended dosage of Ansomone® for the treatment of children growth failure is 0.1~0.15IU/kg daily subcutaneous administration for 3 months to 3 years. Therapy regimen could be modified according to experienced doctors suggestion. The recommended dosage of Ansomone® for the treatment of severe burn is 0.2~0.14IU/kg daily subcutaneous administration for 2 weeks. Growth hormone may cause transient hyperglycemia; it can be recovered as the administration proceeded or terminated. Adverse reactions occurred in about 1% short stature children in clinical trial. Common adverse reactions include slight pain, tingle, turgescence around the injection site and peripheral edema, arthralgias. All of those adverse reactions often occurred at the beginning of treatment, and were temporal and tolerable. Long-term and high dosage administration of rhGH may develop the antibodies in a few patients. However, the antibodies concentration could be rarely up to as high as 2 mg/L that might affect the therapeutic efficiency. 1. Ansomone® should not be used in patients whose epiphysis had been closed. 2. Ansomone® should not be used in cancer patients with active neoplasia. GH therapy should be discontinued if evidence of neoplasia develops. 3. Ansomone® should not be used in patients in acute shock stage with severe infection. 1. rhGH therapy should be conducted on exactly diagnosed GHD patients under advice of experienced doctor. 2. For diabetes patients, dosage of anti-glucourea drugs should be adjusted during rhGH therapy. 3. For patients whose GHD were caused by encephaloma or encephalic wound, the progress and relapse possibility of potential diseases should be closely monitored. 4. For ACTH deficiency patients, dosage of ATCH should be adjusted because the growth improvement effect of rhGH could be inhibited by simultaneous using of ACTH. 5. Thyroid gland function should be tested regularly because clinical hypothyroidism may occur to some patients during rhGH therapy. For those hypothyroid, thyroid supplementation is necessary for ensuring the therapeutic effects of rhGH. 6. Careful consideration should be taken if claudicating occurred during rhGH therapy because the patients who suffered from endocrine system disease (including GHD) have such a tendency that their epiphysis plates of femur are relatively easy to separate. 7. Growth hormone may lead to over insulin state, attention should be paid to if lower glucose intolerance appeared. 8. Do not take over-dose of rhGH, one time over-dose rhGH administration can lead to low blood sugar and succeeded with high blood sugar. Long-term over-does rhGH administration can lead to acromegaly. 9. Injection site should often variation in case lipoatrophy. Response to rhGH of children is similar to that of adults in pharmacology, toxicology and pharmacokinetics, rhGH is safe for pediatric use. Response to rhGH of old patients is similar to that of adults in pharmacology, toxicology and pharmacokinetics, rhGH is safe for geriatric use. Responses to rhGH therapy might be inhibited by glucocorticoid, so that hydrocortisone dosage would be lower than 10~15mg/m2 of body surface during rhGH therapy. Simultaneous using of non-androgenic steroid during rhGH therapy can accelerate growth rate. There is yet no report about over dosage of rhGH; however, over dosage may cause some side effect, such as hypoglycemia at the beginning then succeeded with hyperglycemia. Long-term over dosage using of rhGh can lead to acromegaly. Keep at 2~8ºC away from light. The reconstituted solution mixed with Sterile Water for injection is advised be stored at 2~8ºC for 48 hours, do not be frozen.